Comedy Works at Georgine's in Bristol, PA! : FUNNY FACES! Georgine's Restaurant, 1320 Newport Rd., Bristol, Pa.
Just click on the Georgine's logo to link to the Georgine's Restaurant website. We recommend that you spell your last name and repeat your phone number slowly. We hold Show Only reservations until 9 PM before each show. All reservations are on a "First Come-First Serve Basis" and are taken in order of payment at the door. We confirm all dinner-show reservations by phone. All Special Shows (New Year's Eve, Valentine Weekend, Girl's Night Out, etc.) where tickets must be purchased in advance are Non-Refundable! We accept Friday Night dinner reservations until 6:00 PM on the day of the show unless we are sold out. We will confirm all dinner reservations. Please be sure to leave a phone number that you will answer or where you can be reached. If we can not speak to you...you will not have a confirmed reservation. If you have any changes in your dinner reservation, you must contact us by Friday- 10 AM on the day of the show. If you do not contact us by 10 AM, you will still incur a seating charge for the show for each person who does not show-up for your original dinner-reservation . Charges vary according to the show-only rate. On Saturday Night we do not offer a dinner show special...but you can still have dinner before the show in the restaurant...call Georgine's for more information. 215-785-0564. Everyone must wear clothes and clean underwear regardless of their lifestyle. No handcuffs, chains or fish net stockings. (unless you're hot!) Use your best judgement...it's not a tractor pull! Students ages 17-21 need proper identification for admittance on their own. The Comedy Works wants everyone attending the show to have a fun time. In order to guarantee a good show, we retain the right not to admit anyone who is intoxicated or remove anyone who becomes disruptive during the show from excessive talking or heckling, etc. In the event that they are removed or asked to leave during the show, there will be no refunds. Please see our current Snack menu by clicking on the tab on top. Thank you. Send us an e-mail and include your first and last name along with your ZIP CODE in the subject line. Every month we'll pick a winner to receive a pair of FREE passes to an upcoming show. We are always looking for new male or female comedians to play our club. Send us your contact info with Bio and Picture. We will get back to you and see what we can do. Guest sets are scheduled for Saturday evening shows. The Comedy Works started in 1980 on the 3rd floor of the Middle East restaurant located on Chestnut St. in Philadelphia, Pa. The club had a unique room with seating for over 300 people There was a balcony area and a room that defined what a true comedy club should be. The club was open every day of the week, with 2 shows a night from Thursday through Sunday. There were days for open mic nights where upcoming comedians could try their new material. 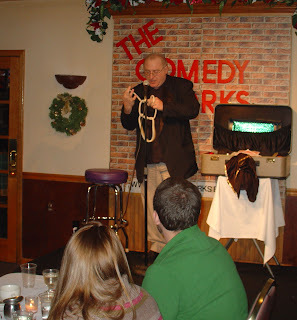 In 1990 the Comedy Works opened their second club in the Bucks County Area at Georgine's Restaurant located in Bristol, Pa. Smaller in size, the club seats 225 people and offers great comedy, good food and FREE PARKING! 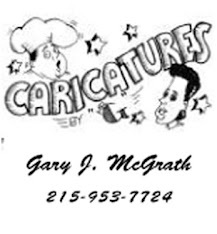 Now in it's 21 ST year at Georgine's Restaurant, the Comedy Works is still going strong as the longest and oldest comedy club in the Philadelphia region.